Vicki and the Doctor find that Steven Taylor has not only survived the Dalek-Mechanoid War, but has managed to stow away on the TARDIS. The Doctor is willing to accept Steven as a companion, with the one demand that he not call him “Doc.” Steven is completely incredulous about what the TARDIS is and does, in no small part because of what it looks like. 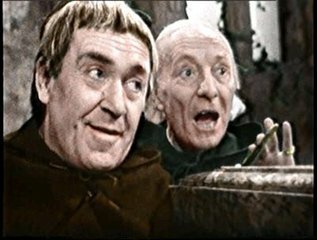 Meanwhile the TARDIS lands on the coast of Northumbria in 1066, as a man in a monk’s garb watches, but he is concerned rather than shocked or confused, and proceeds to spy on the TARDIS’ crew as they leave the ship. The Doctor orders Vicki and Steven to stay behind while he goes to find some locals, but Steven goads Vicki into helping him do some exploring of his own. At a nearby village the Doctor meets Edith, whom he wrings some hospitality and information from without exciting her suspicions. From their conversation he deduces that the Anglo-Saxon king Harold Godwinson had recently become king of England and has yet to fight in the Battle of Stamford Bridge. Before going the sleep the Doctor hears the chants from the nearby monastery seems to slow down like a recording. Once the Doctor learns from Edith that the monastery was until recently abandoned and that the villagers have only ever seen one monk, he immediately decides to set out there to investigate. Back near the beach, Steven and Vicki encounter a man who has picked something up from the ground. Steven wrestles the object from him and discovers that it’s a wristwatch. At the monastery, the Doctor finds a phonograph playing the chants, but unfortunately he also finds himself in the wrong end of a cage trap. The following morning the Monk prepares a breakfast for him, using all sorts of twentieth-century conveniences. Elsewhere Stephen and Vicki are likewise captured and brought before the village council, who debate whether they are travelers or Viking spies. Most of the council become convinced when Vicki reveals that the Doctor, whose description Edith recognizes, is with them. Following Edith’s advice, Steven and Vicki head to the monastery and find the Monk, who claims neither he or the “other monks” saw anyone, but Steven apparently tricks him into giving off a clue that he was lying. Vicki, however, senses a trap.